Genotyping and phylogenetic analysis revealed amino acid changes in parental CypA that occurred throughout evolution. 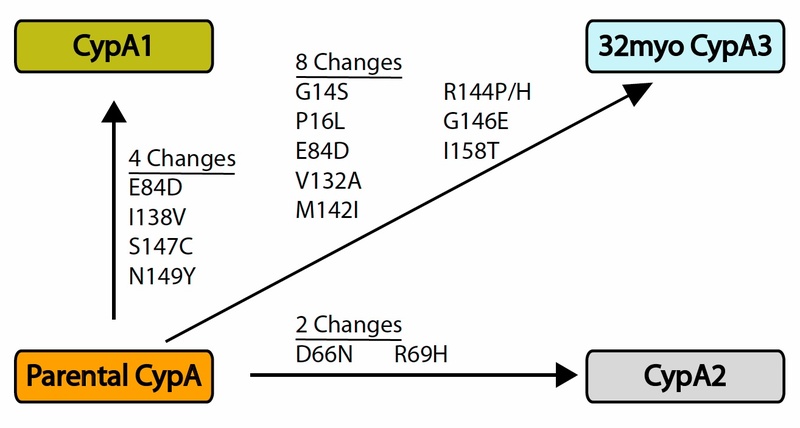 Four point mutations in CypA1 narrowed the broad antiviral activity of parental CypA. With similar logic, Malfavon-Borja et. al. argue that the 8 amino acid changes in the novel CypA3 gene fusion they have identified generated a viral restrictive factor with specificity for a limited number of (ancient) viruses. Paleovirology is a relatively new branch of Evolutionary Biology dedicated to the study of ancient viruses and their impact on host biology. Host genomes are amazing adept at challenging viral infection both short-term (immediate immune responses) and long-term (co-evolution with viral proteins). The existence of ancient genomic changes in host anti-viral factor encoding genes can have strong implications about the viruses that infected the primate lineage. These genomic changes, usually advantageous at the time of their birth, helped to shape the modern primate immune system. Of the plethora of genes that contribute to a host’s innate immune response to viral infection, the protein encoded by the TRIM5 gene is of particular importance. TRIM5 is a retroviral restriction factor that limits the life cycle of several retroviruses by binding the viral capsid protein. Modifications in the TRIM5 locus in a range of primate and non-primate species throughout evolution has made TRIM5 better able to inhibit viral infection. These modifications include point mutations in the capsid-binding coiled-coil domain of TRIM5, as well as novel TRIM5 gene fusions, that allowed TRIM5 to retain robust capsid binding. TRIMCypA1, a recently discovered TRIM5 gene fusion event with retrotransposed Cyclophilin A (CypA) that was identified in owl monkeys, occurred 4.5-6 million years ago (Mya). This TRIM5 chimeric protein has potent activity against several retroviruses including HIV-1. Another TRIMCyp gene fusion, TRIMCypA2, occurred in macaque species around the same time period to generate a second independent TRIM5 chimera. These fusions of TRIM5 with CypA enhanced the capsid binding activity of TRIM5, giving rise to a novel antiviral defense activity. A recent paper published by the Malik and Emerman Labs (Basic Sciences Division) reveals two additional TRIMCyp fusions that predate TRIMCypA1 and TRIMCypA2 by nearly 37 million years. To determine if other TRIMCyp gene fusions existed in primate genomes, Malfavon-Borja et. al. sequenced the TRIM5 locus from primate fibroblast cells for the presence of CypA retrogenes. Along with CypA2 (present exclusively in macaques), the authors were surprised to discover two additional TRIM gene fusions they named CypA3 and CypA4. Similar to CypA2, CypA3 was present in the macaque species examined but was also found in the more ancestral gibbons lineage. Since both gibbons and Old World monkeys have CypA3 retrogenes, this suggested that the ancestral CypA3 retrogene was acquired in primates at least 32 Mya based on phylogeny. However, further phylogenetic analysis revealed two additional features of this novel gene fusion: (1) CypA3 was at least 43 million years old and (2) likely functioned for 10 million years before it was pseudogenized. Given the genomic presence of TRIMCypA3, it was likely that this TRIMCyp gene fusion was transcribed to produce a protein with novel anti-viral activity. The researchers probed total mRNA isolated from primate fibroblasts by RT-PCR and found TRIMCypA3 transcripts from a variety of species. Although present, the TRIMCypA3 sequencing data revealed deleterious stop codons in TRIMCypA3 from present-day macaques. The presence of pseudogenizing mutations in TRIMCypA3 acquired since its birth indicated that its function as a viral restricting factor had ceased to be necessary in primates as time advanced. However, the expression of a nearly full-length TRIMCypA3 transcript in gibbons indicated that the chimeric protein might once have had a viral restricting function. In a final line of investigation, the researchers expressed the TRIMCyp chimeras in tissue culture cells and tested their ability to inhibit viral infection by ancient paleolentiviruses and modern lentiviruses (e.g. HIV-1 and HIV-2). For these experiments, owl monkey TRIM5 was fused to a CypA3 sequence deemed to be present based on phylogenetic analyses 32 Mya (TRIM5-32myoCypA3) or to the parental CypA sequence from which CypA3 was derived (TRIM5-parental CypA; see figure). Astonishingly, TRIM5-parental CypA displayed a broad and potent antiviral activity, but TRIM5-32myoCypA3 did not show antiviral activity against any of the lentiviruses tested. These results indicate that the most ancient TRIM5-CypA fusion protein could restrict a broad range of retroviruses, but that subsequent evolution refined its activity to a limited number of ancient retroviral capsids. Thus, TRIMCyp3 likely arose to combat a viral pathogen encountered by primate ancestors 43 Mya. Altogether, the research by Bordia et. al. confirm that studying the genetic changes that occurred in host retroviral restriction factors throughout evolution can shed light on viral encounters that challenged primate health millions of years ago. The techniques and ideas generated by the researchers will fuel paleovirology, a burgeoning field of science less than a decade old. When asked about future directions of research, Dr. Malik states We are pursuing other retrogene insertions in the human and related genomes. While these have been previously ignored/dismissed as pseudogenes, it is clear that among them might reside powerful new antiviral functions." Malfavon-Borja R, Wu LI, Emerman M, Malik HS. 2013. Birth, decay, and reconstruction of an ancient TRIMCyp gene fusion in primate genomes. Proc Natl Acad Sci. 110: E583E592.